NASA's Parker Solar Probe is officially on its way to the sun. 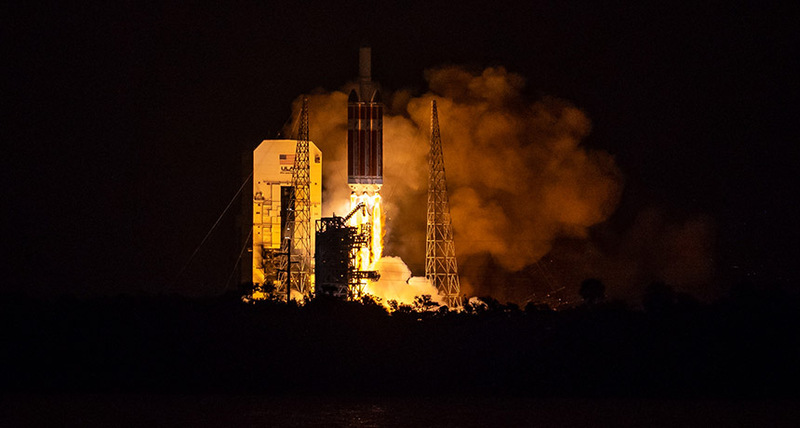 After a one-day delay, the probe took off into a dark, cloudy sky over Cape Canaveral, Fla., aboard a Delta IV Heavy rocket at 3:31 a.m. EDT on August 12. "Here we go," said 91-year-old solar physicist Eugene Parker, the spacecraft's namesake, as he watched the launch. Parker proposed the existence of the solar wind, a stream of charged particles flowing away from the sun, in 1958. The Parker Solar Probe is the first NASA spacecraft named for a living scientist. The craft will spend the next six weeks making its way toward Venus, where it will use that planet's gravity to direct itself toward the sun. Six weeks after that encounter, in early November, it will make its first close approach to the sun. On each of its 24 orbits, the probe will spend a few days within the sun's corona before swinging back out to cold, dark space and transmitting data to Earth. Scientists expect to receive the first data in December on the sun's electromagnetic environment, charged particles and hot moving plasma. The data will help unlock solar mysteries that have vexed astronomers for decades, including why the sun's corona is so much hotter than its surface and how the solar wind accelerates into space.